University video game design programs have been spreading like wildfire around the world over the last ten years. They allow students, researchers and game developers to work on their craft in an academic environment away from the harsh realities of the market, and have led to some interesting products like Fl0w from USC and Ulitsa Dimitrova from Germany. Both games take on topics not often addressed in mainstream games and do so in simple, poignant ways that aim to influence the rest of the game design community as these people make their way out of school and into the industry. Along those lines, the GAMBIT MIT Singapore Game Lab is an endeavor that has produced some really cool results. This joint venture between MIT and the Singaporean government seeks to, like so many game labs around the world, bring academics, students, and industry folks together to see how they can change the gaming world. Most of the four full-scale games the project has created are cool games, and some have won IGF and other prestigious indie game awards. But they lack the social power and importance of GAMBIT's most recent work: A Closed World. The gameplay reminds me of Costume Quest, but with the comedy replaced by an earnest discussion of the sexual identity of young people. It follows a teenage protagonist, male or female, as they journey through a mysterious forest, battling their inner demons. The battles (above) are classic JRPG faire starring a simple rock-paper-scissors mechanism, couched in a battle beween logic, passion, and ethics. 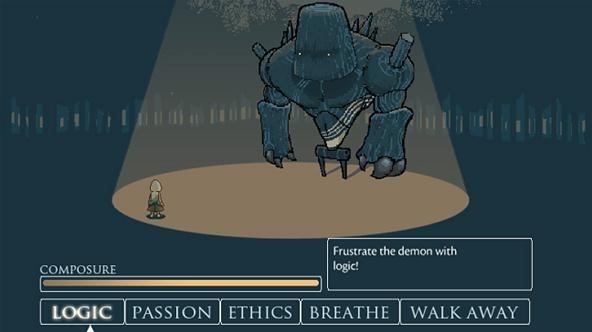 When each demon is defeated, a beautiful little cutscene (below) will reveal more of the story that led our young hero to wander a forest full of demons alone at night. 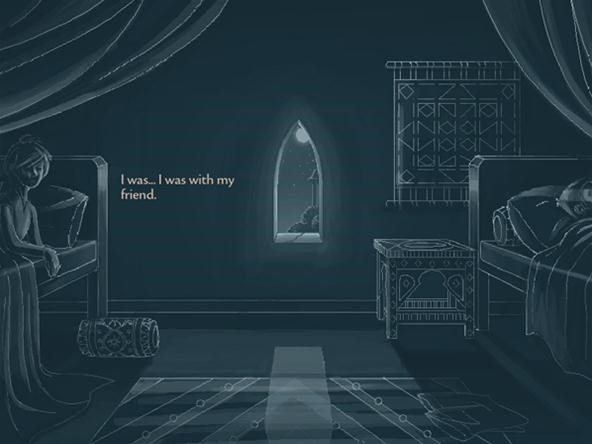 LBGTQ issues have long been even more taboo in games than elsewhere in entertainment. Dragon Age 2 is one of only a handful of games that feature homosexual romance, and it took a lot of flack from some circles for it. Hatespeech against homosexuals is rampant on multilplayer servers around the world. Game companies fear all of this, and thus stay away from these very real and important issues. Fortunately, the students at GAMBIT are not constrained by shareholders, profit margins, and fear of media backlash. They're starry-eyed college kids and thoughtful academics with a message they want to convey: being one's self is always okay, and is the only way anyone will ever be happy. The game is free to play in-browser here, and only takes about 20 minutes to beat. Support it, and hopefully it will help take games to a more honest and socially relevant place.